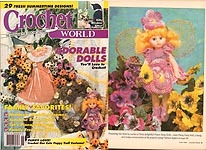 Crochet World magazine was originally published by House of White Birches. To keep them economical, the earlier editions were printed on paper that was just a step up from newsprint, so older issues will likely have age- yellowed pages. If I remember correctly, the magazine went out of print for a while, but then came back with higher- quality glossy pages, and it is still in publication from DRG. 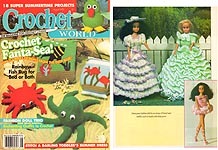 Crochet World, February 1990. 11-1/2" Doll Sweetheart Dress, Three Piece Outfit, Denim Set, Ski Jacket and Pants, French Clown Hand Puppet, Ladies' Aran- Style Dress, Tote Bag, Popcorn Shoulder Tote Bag, My Pink Valentine Dress (19" doll), Shaded Afghan With Pillow Pocket, Burgundy Cardigan, 20" Doll Read and White Party Dress, 20" Doll Variegated Blue and White Dress, Dropped- Waist Dress for 20" Doll, Crissy Dreas and Shoes, Toddler's Hat- Scarf- Mittens Set, Hat and Mittens, Hat and Scarf, Scarf and Beret, Child's Hooded Sweater, International Dolls -- Miss South Vietnam, Country Treasures Granny Square Afghan, Ruffles the Rabbit, Carrie Carrot Bookmark, Miniature Booties. Good used condition. 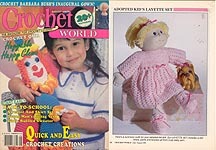 Crochet World, April 1990. Country Rug, Miller's Hat, One- Piece Mittens and Headband, Child's Sweater Vest and Tote, Baby Girl Three Piece Set (Sweater, Bonnet, Booties), Romper Set (Romper, Sweater, Pants, Slippers, and Hat), Miss Thailand (13" doll), Pineapple Cluster Doiy, Lady Ashley Doily, Yellow Shells Doily, Doily of Stars, Purple Passion Afghan, Starburst Afghan, Hearts and Flowers Afghan with Heart Valance, Easter Rabbit, Easter Plant Pokes, Sunny- Side Up Pillow, Diamond Shadows Throw Pillow, Lavender Tweed Vest, Snappy Stripes Skirt and Top, Mohair Jacket with Silk Trim, Baby Cover- Up, Funky Mouse, Square Patterned Pillow, Tooth Fairy Doll. Definitely used condition -- former owner's name on cover, notes & wear on doily pages, cover detached from pages. This actually was one of (my) Grama's Favorites. Crochet World, June 1990. Spring Leaves Lace Curtains, Party Patty doll, Pennsylvanita Dutch Touch Rug, Lighthouse Doily, Nine- Patch Pillow, Indian Home Wall Hanging, Country Basket Skirt, Bunny Tissue Cover, Block Tissue Cover, FLower Basket Pillowcase, Sewing Machine Cover, Flower Girl Basket, Pineapple Tablecloth, Classic Antique Chair Set, Diamond Filet Sweater, Ladies' Spring Cross- Over Sweater, Crisscross Cover Up and Tote, Three Piece Yellow Baby Set, spring Breeze Collar, Double Brackets Rug, International Doll: Miss Zaire, Country Patch Towel Holders and Potholders, Pineapple Doily, Tulip Potholder, Catnip Mouse. Very good used condition. 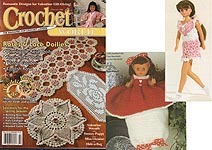 Crochet World, August 1990. International Doll: Miss Finland (13"), Horizontal Serpentine Rug, Hanky Edging, Decor Pillowcase Edging, Evening Purse, Six- Point Motif for Diamond Doily and 2 Small Doilies, Refreshment Set, Star Coaster Set, Barbara Bush's Inaugural Gown (7 - 8" doll), Girl's Hearts and Stripes Sundress, Diamond Lace Doilies, Little Star Doily, Girl's Black Yoke Sweater, Little Schoolgirl's Sweater, Sweater and Skirt Set, Pretty Pink Outfit (Coat, Jumper Dress, Beret, and Purse for little girls), Girl's Ruffled Sweater, Young Man's Zigzag Vest, Pineapple Collar, Bubblegum Clown, COcker Spaniel Puppy, Adopted Kid's Layette Set (Dress, Pants, Booties), Rose Jar Top Cover, Busy as a Bee Potholder, Checkered Potholder, Table's Already Set Place Mat and Napkin Ring. Very good condition. 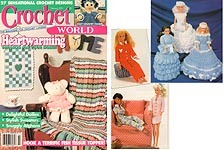 Crochet World, December 1990. Game Board Afghan, Cuddly Pig Pillows, Snowman Afghan, Icicle and Wreath Ornaments, Santa face Ornament, Two Fan Ornaments, Christmas Stockings (Rail Fence, Burgundy and White), Striped Linen Jacket, Men's Fairisle Vest, Winter Fantasy Ladies' Sweater, Fashion Doll Fun Contest Winners (Santa & Mrs. Claus, Party Dress and Tuxedo, Old Fashioned Girl), Fluffy White Rug, Dancing Bears Baby Afghan, Baby Bottle Cozies (Lion, Elephant), Country Treasures Dolls, Ballet Slippers, Cartwheel Doily, Pineapple Filet Tablecloth, International Dolls -- Miss Korea (13"), Afghan With Matching Pillow, Pencil Head Stocking Stuffers. Very good condition. 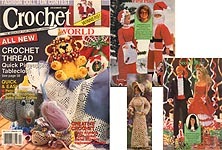 Crochet World, December 1990.Game Board Afghan, Cuddly Pig Pillows, Snowman Afghan, Icicle and Wreath Ornaments, Santa face Ornament, Two Fan Ornaments, Christmas Stockings (Rail Fence, Burgundy and White), Striped Linen Jacket, Men's Fairisle Vest, Winter Fantasy Ladies' Sweater, Fashion Doll Fun Contest Winners (Santa & Mrs. Claus, Party Dress and Tuxedo, Old Fashioned Girl), Fluffy White Rug, Dancing Bears Baby Afghan, Baby Bottle Cozies (Lion, Elephant), Country Treasures Dolls, Ballet Slippers, Cartwheel Doily, Pineapple Filet Tablecloth, International Dolls -- Miss Korea (13"), Afghan With Matching Pillow, Pencil Head Stocking Stuffers. Cover torn up about 3/4" at bottom of spine, purple stain on one page but printing still readable. Otherwise good condition. 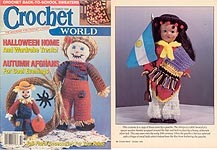 Crochet World, Fall 1991. Country Hearts Afghan, Yellow Ribbons Afghan, Patchwork Afghan, Sage and Spruce Pullover, Teen's Nordic Sweater, Girl's Yellow Cardigan, Girl's Sweater, Haunted House Door Decoration, I Love My Grandma Wall Hanging, Scarecrow Door Hanging, Build Your Own Monster Pillow, Rose-Trimmed Ensemble for Fashion Doll, Petite Pineapple Centerpiece, Goldilocks Doilies, Back- To- School Lunch Box, Football, Stackable Rainbow Rings, Dottie Dachshund, Holly Pot Holder, Stocking Pot Holder, Christmas Tree Towel Edging, Solo Cup Bells, Tree Garland. 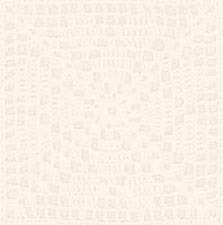 Page yellowing, some bent corners; otherwise, very good used condition. 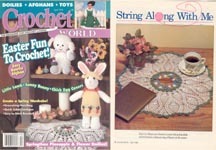 Crochet World Spring Special, 1992. Floppy- Eared Rabbit, White Rabbit, Buds & Blossoms DOll Christening Outfit (adopted kids dolls), Blue Ribbon Afghan, Lace Afghan, Floral Nine- Patch Afghan, Relief Squares Afghan, Peach Handkerchief Edging, Flowery Fan, Floral Pot Holders, Cotton Camisole, Three- Hour Vest, Rich Texture Vest, Baby Blocks Bib, Checkerboard Bib, Rose & Ruffled Hair Clips, Easy Bookmarks, Teddy Bear Wall Hanging, Flowering Star Doily, Flowery Yarn Pot Holders, Rabbit RUnner, Shamrock Pot Holder. Very good used condition. 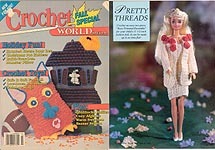 Crochet World June 1992. Travelin' Blanket, Court Jester, Delicate Doily, Macaroni Trimmed Socks, Ring Bearer's Pillow, Bridal Garters, Bridal Runner, Luv Doily, Fashion Doll Handkerchief Dress, Country Cousin Dresses, Nautical Shadows Afghan, Mother's Day Gold Necklaces, Crochet Symbols Part II, Little Miss Muffet (yarn hair doll), Father's Day Tie, Men's Slippers, Lacy Basket, Graduation Babies, Bridal Hankie, Rose Sweater Shell, Petal Trim Valance and Pillow, Quickie Watermelons, International Dolls - Miss Honduras (14 inch). Very good used condition. 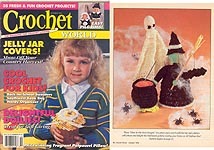 Crochet World, October 1992. Pearls & Lace Filet Collar, Bird Cage, Autumn Leaves Afghan, Regina's Star Afghan, Confetti Blocks & Stripes Afghan, Lightweight Afghan, Rose Blocks Afghan, Kid's Witch Hat, Halloween Pot Holders, Black Cat Scarf, Fall Wreath, Squash Mats, Baby's Track Suit, Infant Set, Country Floral Runner, Fans 'n' Flowers Doily, Bhild's Boat- Neck Sweater, Child's Blue Sweater, Miss Argentina Doll (13"), Mr. Scarecrow, Fall Doily, Oven Mitts, Unisex Haze Green Vest. Very good used condition. 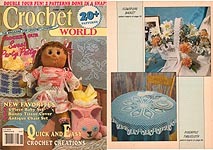 Crochet World, April 1993.Easter Bunny Troll, Knittin' Granny Bear, Pot Belly Pig, Easter Hat Wall Hanging, Floral Greeting Card, Striped Easter Dress, Hearth Broom, Grandmother's Pillow, Delft Tile Pillow, MissyMop Doll, Irish Crochet Doily, Pretty Li'l Tablecloth, Natural Shade, Imperial Rose Afghan, Navy and White Afghan, Blue Baby Set, Pretty V- Pullover, Man's Post Panel Vest, CountryTweed Runner, Flower Garden Honeycomb Rug, Southern Belle in thread crochet, Flower Pot Holders, Heavy Duty Floral Pot Holders, and 13" Miss Laos. Excellent condition. 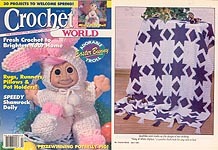 Crochet World June 1993. Johnny's Puttin' on the Ritz Tissue - Top Hat Bathroom Tissue - Soap Holder set, Evening Clutch Purse, Stretchy Bridal Garters, Double Wedding Ring Afghan, Bridal Pillow Top, Bridal Headpiece & Veil, Bassinet ornament / trinket box, Colorful Baby Blanket, Easy Bibs, Baby's Basket, Baby Crib Coverlet, Toddler's Ruffled Hooded Sweater, Alphabet Blanket, Bottle Buddies, Baby's One Piece Suit, Jade & Coral Kitchen Set, Rectanbular Filet Mats, Fashion Doll Pineapple Ruffles Dress, Spool Bride Doll, Pot Holder Quartet, Infant's Creeper, Openwork Pineapple Doily, International Dolls - Miss Romania (13 inch). Very good used condition. Crochet World, October 1993. Baby's Party Pinafore, Potpourri Pillow, Golw- In- The- Dark Designs (Witch & Bat, Ghost, Cauldron), Multicolored Sweater, Child's Striped Cardigan, Boy's Mocha & Bronze Sweater, Classic Pullover, Peach Centerpiece, Fans Doily, Doily Within a Doily, Bedside Reading Caddy, Over- the- Shoulder Book Bag, Pilgrims on Brooms, Two Black Cats Pillow, Lacy Jar Topper, T- Quilt Afghan, Rustic Express Afghan, Class President Vest, Ruffled Jar Cover, Miss Turkey (14" doll), Jelly Jar Covers, Back- To- School Organizer. Very good condition. 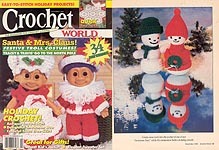 Crochet World, December 1993. 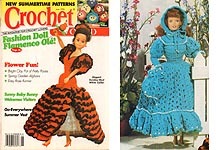 34 patterns, including Santa & Mrs. Claus Troll Costumes, Antique Snowflakes, Colorful Stars Tree Skirt, snowman Duo, Antique Snowflakes, Warm Kid's Jacket, Elegant Sweater Set, Poinsettia Doily, Blossoms Bear, Floppy Clown, Little Girl's Red Dress, Tiny Ballet Slippers ornaments, 3 afghans, pillows, doilies, Miss Iceland 13" doll, Thanksgiving Placemats, Father Christmas, Stars of David, Christmas Tree Skirt, ladies' sweaters, and more. Very good condition. 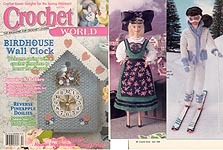 Crochet World, February 1994. Tyrannosaurus Rex, Valentine Cards, Hnging Message, Large Centerpiece, Duck Jump Rope, Romantic Heart Edging, PonyTail Holders, Gathering Acorns Doily, Child's Pullover & Hat, Special Request Pineapple Tablecloth, Daisy Fairl yDoll (9-3/4"), International Dolls: Miss Venezuela, First Lady's Inaugural Gowns: Hillary Rodham Clinton, Easy Cotton Potholders, Kelly Cow, Mini- Snowflake Afghan, Rainbow Hat & Scarf, Car Scarf & Hat, Country Girl Wall Hanging, Basket Weave Trimmed Cardigan, Wall Clock, Granny Square Wall Hanging, Jade Green Shell, Little Boy Blue Blanket, Tatted 7 Crocheted Edging. Very good condition. Crochet World, April 1994. Butterflies Centerpiece, Fashion Dolls Three in One Doll Dress, Springtime Hats, Easter Egg Place Mat Set, Sunglasses Holder/ Scarf Pin, Little Rabbit, Easter Eggs, Heavy Duty Potholder, Playful Bunny, Old Time Bathtub Hanging, Twinkling Star Area Rug, International Dolls: Miss Chile (14"), Boy's Navy Blue Pullover, Kid's Zippered Cardigan, Ecru & Wheat Cardigan, Child's Checkerboard Vest, Rosebud Fairy Doll (9-1/2"), Daffodil Doily, Oval Doily, Coming Up Roses Doily, String of Hearts Baby Afghan, Block Blanket, Aqua Specks Baby Blanket, Lacy Baby Cover, Sweet Baby Benjamin Bear, Champion Andre Bunny with tennis racquet. Very good used condition. Crochet World, June 1994. Heirloom Motif Tablecloth, Big Is Beautiful Sweater, Toddler's Pineapple Dress, Lovely Lady Broom Doll, Baby's Striped Overalls, Sunshie Baby Afghan, Pink Baby Bunting, International Dolls: Miss Panama (14"), Daisy Wreath, Stawberry Jar Cover, Ring Bearer's Pillow, Heirloom Wedding Frames, Pansy Fairy Doll (9-3/4"), Fancy Feline, Striped Lap Throw, Greens of Spring Afghan, SpringPosies Afghan, Child's Red White & Blue Vest, Watermelon Top, Jade Shell, Black Sequined Evening Bag, Girl & Boy Baby Dolls & Carrier, Puppy Troll, Family Treasures Album, County Tweed Dishcloths, Good condition. Crochet World, August 1994. Pollyanna Doll, Curling Iron Travel Holder, Pill Case, Summery Tissue Cover, Long Lace Vest, Patriotic Patty Doll, International Dolls: Miss Uruguay (14"), Easy Patriotic Afghan, Tulip Afghan, Rose Lace Throw, Textured Afghan, Kid's Pocket Sweater & Hat Sets, Girl's Pastel Sweater, Shell Vest, Ecru Handbag, Decorative Table Runner, Hexagon- Motif Place Mat, Raspberries & Cream Doily, Fashion Doll Swimsuits & Totebags, Gertie Gose, Cheddar Mouse, Troll Bridal Couple. Very good used conditon. 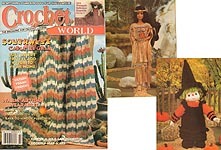 Crochet World, October 1994. Shower Centerpiece Baby Bootie, Peach Blossom Bath Set, Pumpkin Face Trick- or- Treat Bag, Pumpkin Patch Place Mat, Witch's Hat Party Favor, Hunter Pottie Peeker, A Tale About Yarns (article), Fall Pillow, Fall Leaf Pot Holders, Autumn Doily, School Lunch Bag & Pencil Case, Autumn Floral Print Afghan, Twin Bed Country Coverlet, Granny Afghan, Blue & Yellow Diagonal Shell, Cow Kitchen Set, Stained Glass Pillow, Night Sky Ball Gown for Fashion Doll, Gingham Place Mat & Coaster, Piglets For Sale Doorstop, JJ's Booties, Cable- Trimmed Cardigan Coat, Ruffled Autumn Doily, Miss Austalia (13"). Very good condition. 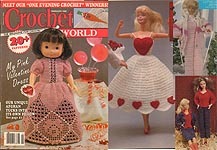 Crochet World, February 1995. Festival of Hearts Teddy Bear or Adopted Doll Outfit, Eight of Hearts Doily, Long Coat, Drawstring Bag, Mini- Quilt Wall Hanging, Fashion Doll Ensembles (Princess Aurora Beth, Miss Abegaile Lynn, Anna), Bedtime Boutique (Pink Nightshirt Red Pajamas, Pastels Pajamas)Heart Motif Runner, Baby Afghan, International Dolls -- Miss Barbados (14"), Trinity Stitch Sweater, Off White Cables & Posts Sweater, Fiesta Tweed Granny Afghan, Dusty Rose Doily, Peach Delight Place Mat, Country Home Wall Hanging, Country Girl Candy Jar, Rainbow Dishcloth, Woven Plaid Throw, Two Square Pot Holders, Basket of Kittens, Child's Gold Sweater, Heart Dream Pillow, Fish Tissue Cover, Shells of Country Rose Afghan. Very good used condition. 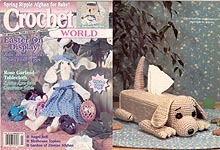 Crochet World, April 1995. 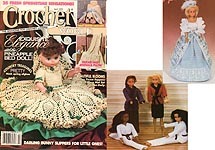 Fashion Doll Marie Antoinette Gown, Doll Krate Costumes & Variations (Karate Jacket & Pants, Her Jacket with Shawl Collar, His Smoking Jacket, Skirt, His Trousers), Pincushion & Utensil Holder, Thimble Hat Sewing Kit, Little Girl's Dress with Matching Hat & Purse, Pineapple Bed Doll, International Dolls -- Miss Burma (13"), Think Spring Afghan, Easter Egg Place Mats, Daisy Place Mat, Bunny Love Pillow, Easter Basket & Bunny, Ladies' Peach Lace Pullover, Greenleaves Bookmark, Women's Vest, Sweetheart Barrettes, Child's Slippers (Bunnies, Happy Face), Lavender Stripes Afghan, Delicate Daisy Adghan & Pillow, Oval Ferris Wheel Tablecloth, Spring Place Mats, Spring Pot Holders, Roses Tissue Toppers, Rose Garden Doily. Very good used condition. 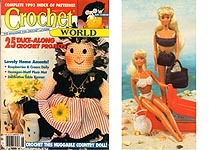 Crochet World, June 1995. Pretty Ruffles Baby Dress, Teddy Bear Mobile, Fashions for Baby (Boys and Girls sweater, bonnet, bootie sets), Post 'n' Shell Baby Sweater Set, Jeremiah & Sarah Brown Bear, Quilted Heart Pillow for Mom, Jade Evening Bag, Country Cow Crochet (Chocolate Cow Filet, Cow Head magnet), Yummy Wedding/ Anniversary Cake, Sailboat Baby Blanket, Armchair Cady, Smocked Baby Bonnet, PiggyPockets, Lacy Short- Sleeved Pullover, Easy Carriage Robe, Ocean Waves Baby Blanket, Father's Day Tie, Spring Pastels Afghan, Le Moyne Star Chair Cushion Set, Easy Tote Bag, Women's Sweater, Sunbonnet Fridgie Girl, International Dolls - Miss India. Very good condition. 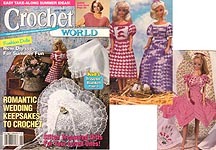 Crochet World, August 1995. Pretty Pink Sweater, Toddler's Summer Dress, International Dolls -- Miss Bulgaria (13"), Patriotic Checkerboard & Checkers Bag, Crocheter's Caddy, Swimsuit Cover- Up, Deep Blue Sea Pillows (Coral Reef Pillow, Fish Bowl Pillow), Rainbow Fish Rug, Stuffed Octopus & Crab, Trio of Outfits for 11-1/2 inch Fashion Doll (Southern Gown & Hat, Ballet Tutu with Slippers, Ruffles Galore Gown), July 4th Picnic Blanket, Potpourri Hat, Pudgy Parrot. . Very good condition. 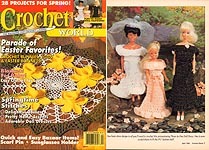 Crochet World, April 1996. 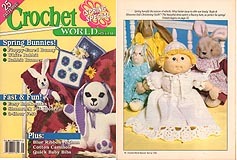 Cottage Baby Afghan, Pierrot the Clown, Sunny Bunny, Little Lamb, egg Bunnies, Miss Guinea for 13" doll, Irish Colleen for fashion doll, Pup Tote Bag, Drawstring Handbag, Flower Fantasy Doily, Split Cables Cardigan, Easy Striped Baby dress, Pineapple Spring Blooms, and Chick Egg Covers. Very good condition. 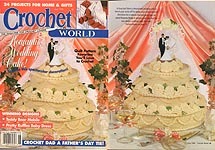 Crochet World, June 1996. Lacy Gloves, Sunday Best White Collar, Springtime Baseball Cap, Fashion Doll Turquoise Dress & Accessories, Fashion Doll Flamenco Dress, Fun Flowers, Miss Ivory Coast (13 inch), Baby Bunny Sunflower Door Hanging, Lacy Red Vest, Flower Faces, Jeffrey Possum, Tulip Afghan, Spring Garden Afghan, Rose Runner, Rag Mop Dolls (boy or girl), Victorian Bathroom Tissue Cover, Pretty Posy Filet Tablecloth. Center pages detached from one staple, but otherwise very good condition. 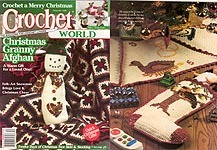 Crochet World, December 1996. Mice Stroll Choir, Twelve Days of Christmas Tree Skirt & Stocking, Folk Art Snowman, Bunting Doll in three sizes, Acorn Apron, Miss Tunisia 13" doll outfit, Evening Capelet, Tiny Christmas Sock, Small Doilies, Blanket Bear, Tiny Christmas Tree, Pair of Christmas Stockings, Crscent & Half- Daisy Small Centerpiece, and Christmas Granny Afghan. Very good condition. 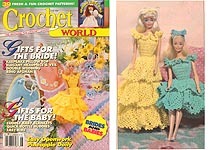 Crochet World, April 1997. Garden of Zinnias Afghan, Quick n' Fancy Tops, Rose Garland Tablecloth, BIllie Bunny, Easter Eggs, Easter Flower Doily, Angel Bell, Puppy Tissue Box Cover, From Scraps to Diamonds Afghan, Easter Baby Ripple Afghan, Ocatagon Beret, Trailing Flowers Edging, Angel Pins, Guardian Angel, Birdhouse Topiary, Miss Cypris for 13" dolls, Boy's V- Neck Vest. Very good condition. 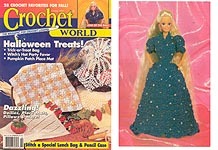 Crochet World, October 1997. Southwestern Cables Afghan, Udderly Silly Scarf, Ladies Speckled Vest, Slate Pin, Pineapple Bathroom Ensemble (Lid Cover, Tank Cover, Air Freshener Doll), International Dolls -- Miss Cuba (14"), Cow- In- A- Milk- Can Doorstop, The Pumpkin Queen yarn hair doll, Kid's Back- To- School Pullover, Native American Afghan, Autumn Shalee Fashion Doll, School Picture Fridgie, Girl's Pink & Pretty Vest, Cappuccino Doily, Cozy Plaid Throw, Terra Cotta Pillow. Very good used condition. 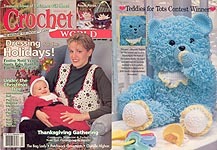 Crochet World, December 1997. The Bag Lady plastic bag holder, People Purses (girl, boy, clown), Festive Motif Vest, Thanksgiving Cornucopia with Squash & Pumpkin, Miss Grenada 14" doll, Patchwork Ornaments (Round, Tree, Heart), Turkey Lollipop Holder, Chenille Afghan, Baby Pacifier Bear (full - size teddy bear), Scarecrow Centerpiece, Christmas Card Ornaments (embroidered crochet cards), Christmas Place Mat Set, Santa Baby Bunting, Place Mat with Matching Coaster & Napkin Ring, Kids' Hat - Scarf - Mittens Set, Amish Print Afghan. Very good condition. 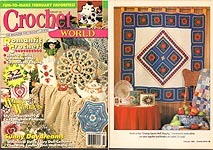 Crochet World, February 1998. Snowman, Nutmeg Bear Sweater, Fashion Doll's Mini-Dress & Sox, Boy's & Girl's Bathrobes, International Dolls -- Miss Ukraine, Winter Garden Runner, Sweetheart Hide- A- Bag, Hooded Cable Sweater, Pineapple Rose Doily, Snowflake Doily, English Rose Doily, Building Blocks Kid's Cardigan, Snozy Puppy, Wedding Ring Filet Afghan, Royal Diamond Afghan, Ruffles & Roses Valentine Wreath, Valentine Pot Holders, Girl's Lacy Sweater. Very good condition. 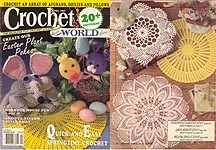 Crochet World, April 1998. Birdhouse Wall Clock, Bendy People, Fashion Doll Alsatian Mademoiselle, Winter Ski Set, Button & Bows Bunny, Easter Pot Holders, Baby's Rainbow Heart Sweater & Pants, Yarnelle the Maid Vacuum Cleaner Cover, Precious Dreams Baby Set, Spring Broom, Miss Ghana (14" doll), Reverse Pineapple Doilies, Bunny Pins. Very good condition. 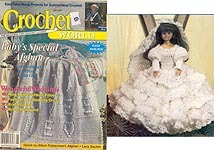 Crochet World, June 1999 God Loves Me Baby Afghan, Tooth Fairy Pillows, Pansies, Bridal Demi- Gloves, Lacy Sachet, Bridal Headband, Ring Bearer's Heart Pillow, Sweet Jessica's Wedding Dress (Fashion Doll), Pink Blossom Doily, Fisherman Bear, Fisherman's Afghan, Soft Pastel Baby Layette, Fortune Cookie Dishcloth, Periwinkle PetalsDoily, Miss Malta (13" doll), Powder Room Door Plaque, Child's Floral Cardigan & Hat. Very good used condition -- slight overall wear, front cover wear.